White chocolate is a confection of sugar, cocoa butter, milk solids and often vanilla and soy lecithin. Unlike true chocolate, white chocolate does not contain cocoa liquor. The USDA allows the use of the term "chocolate" to describe anything containing at least 20%% cocoa butter, 15%% milk solids and less than 55%% sugar. White "chocolate" that does not meet these minimum requirements must be labeled a confection. "White chips" are not a true white chocolate because they do not contain cocoa butter. Vanilla fudge is also marked as white chocolate fudge, but it is not a true white "chocolate." The melting point of cocoa butter (just over body temperature) is high enough to keep white chocolate solid at room temperature, yet low enough to allow white chocolate to melt in the mouth. White chocolate can be used to decorate milk or dark chocolate confections or in many other ways chocolates might be used. White chocolate is sold in solid blocks, discs, chips or bars. Substitutes: None, Though milk chocolate may produce a satisfying, Albeit very different, Result. Choosing: For grating or shaving as a garnish or when wanting chunky pieces, use blocks or bars of high quality white chocolate. White chocolate chips are easier for melting and also go well in recipes like cookies, but be sure they are labeled "white chocolate" and not "white chips." The latter do not have cocoa butter and are excessively sweet and lack flavor. Buying: White chocolate is commonly available in the baking aisle at most grocery stores, and often comes packaged in bars or chips. White chocolate couveture or discs are often high quality with their cocoa butter content clearly marked. Avoid "white chips." In general, the lower the price the lower the quality. White chocolate is primarily used in desserts and candies, either as a main component, dipping or coating element, or as a garnish, for instance grated or shaved into curls as a finishing touch. White chocolate burns easily, so the best methods in melting it are using lower temperatures. 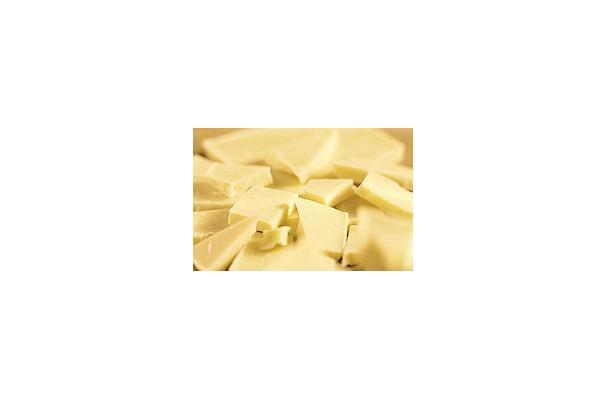 One of the best ways to melt white chocolate is using a double boiler; using a microwave will also work with a lower power setting, constant stirring, and a watchful eye. When white chocolate is overheated, it becomes thick and lumpy. Also, if water comes into contact with the melted chocolate, it will become gritty and grainy. Store white chocolate in a cool, dry place, preferably keeping it in its original packaging, or using storage bags or an air-tight container. Avoid storing in the refrigerator. September 22 is National White Chocolate Day. History: Little is known about white chocolate's origins, however it was first introduced after World War I by the Swiss.